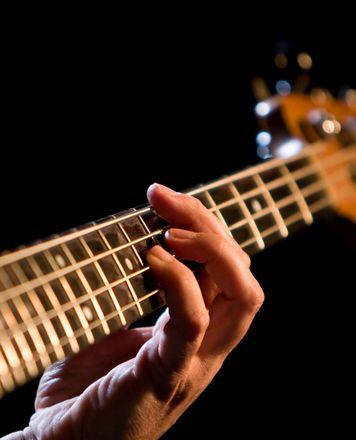 Electric BassWhen Paul McCartney decided on a new bass around 1966, it had ongoing consequences for the entire world of bass: suddenly we were hearing what fantastic arrangements he was playing; melodic and simultaneously rhythmic, sometimes like a mini song within a song. Before then, the great ideas were often lost amongst the rest of the sound - only through reckless experimentation with sound controls on the old vinyl record players were we able to hear more of what was worth hearing. The Rickenbacker Bass was primarily responsible for this sudden realisation of the bass, because only it could produce this new, special sound that no other bass guitar could match. Crisp, perhaps slightly hollow and highly penetrant. Not a standard bass - quite the opposite: an exceptional bass for people who play exceptionally. The 4003 Jet glow keeps to old traditions and won't cost you your house. Cover the lid. Beauty shock. In the hand - play. Cloak - play. To the plant - play. A dream. Everything perfectly set. Do not readjust. The neck absolutely straight. Strings flat. The strings (RIC) wonderful. Usually I use thinner but the original RIC strings are perfectly adjusted to the neck. I leave it on it and am happy with life. Normally, I have decided to dismantle the handrails / pickup covers. I'm completely off. It just belongs there. I quickly got used to it. It educates me to more formal handholding when changing fingers. Wonderful as a hand-held fingerpicking and plectrum game. Otherwise ... the all-all-newest ones are the all-all-best! pretty much the best guitar I've ever owned, its a ric, Need I say more? ID: 150711 © 1996–2019 Thomann GmbH Thomann loves you, because you rock!